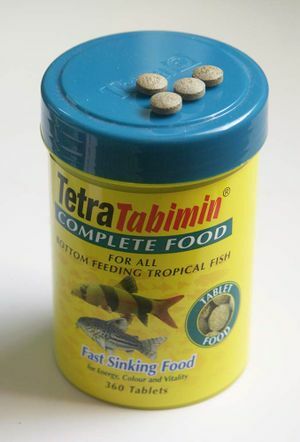 Tetra GmbH, a company based in Germany, makes a range of excellent tablet food called TetraTabimin. This fast sinking tablet food comes in various sizes of tubs with a twist off lid and is sealed with a silver label. 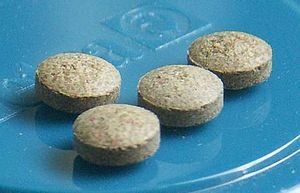 You'll find that each tablet may be too big for one fish, so break it into half or even quarter. It is advisable if feeding to category:Corydoras. This tablet quickly breaks up in a heap within 5 mins. Dwarf African Frogs will eat this. Milk and milk derivatives, fish and fish derivatives, vegetable protein extracts, cereals, yeasts, algae, derivatives of vegetable origin, molluscs and crustaceans, oil and fats, various sugars, lecithin, colorants and preservative. This page was last edited on 22 June 2011, at 19:15.